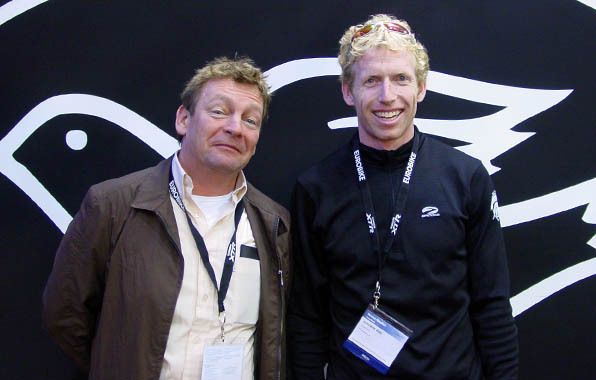 Since I was already going to Europe for the World Age Group Triathlon Championships, when Neil Hassan asked if I'd be attending Eurobike this year, I decided that I just had to go. Neil has been a huge help to me over the years. I credit much of the popularity of BikeCAD in Europe to Neil who took it upon himself to demo the program to many of his contacts in the UK and Italian bicycle industries. Neil is also the man behind the FrameForum.net web site which has a section devoted to BikeCAD discussions. While I was excited to checkout all of the shiny new bikes, I knew that meeting Neil would be the highlight of the show for me. It was great to walk through the expo with Neil and get his insights on some of the noteworthy exhibitors of handbuilt bikes. Neil covered that angle pretty well with his reports on FrameForum, so the photos that follow are just a sample of what caught my eye during my all too short visit to this amazing bicycle trade show in Friedrichshafen, Germany. 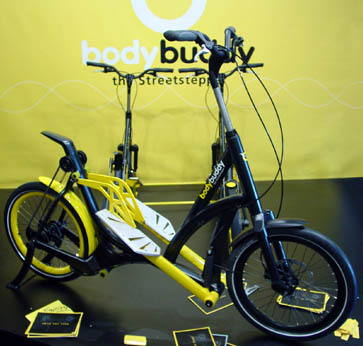 The BodyBuddy Streetstepper is a super fun new bike from Austria. It uses a stairstepping motion for propulsion. The BodyBuddy people were all over the place, riding around in their yellow T-shirts with the slogan "Free the Gym". 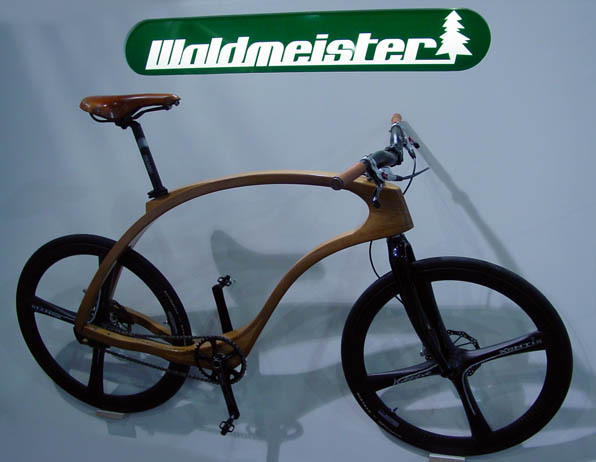 The Bicycle Forest Homebuilders' Gallery has a few wooden bikes, but it was neat to see a commercial offering at Eurobike in the form of this Waldmeister single speed.